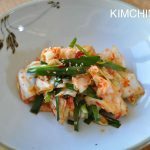 Green Cabbage Kimchi (Yangbaechu Kimchi) is a simple and easy kimchi to make, especially if you are beginner to kimchi making. Whenever I think about making Kimchi, it reminds me of the days when I was still a newly wed. Since my husband and I were both students, we had to save money whenever we could. And there were many student friends who were in the same boat. One early Saturday morning, a very active neighbor/Korean ajooma (married women) friend knocked at the door. Without asking, she decided that she would help me save money by buying a whole box of napa cabbage between the two of us to make kimchi. So she just dropped a 1/2 box of cabbages at my door. I said it was too much and she told me that this was a great deal and did not want to hear anything else. Now, I was 3 months pregnant at the time. After I was done making so much kimchi-I think it was about 12 cabbages-I had pain in my stomach that evening. I mean, there was so many cabbages, I had to brine them in our bath tub. I was so worried that it might be something serious. Luckily, I was fine the next day. But, ‘never again’, I told myself -‘ this kimchi making is just too much work.’ So I never made Kimchi while I was attending graduate school. But recently, I have been wanting to make Kimchi at home because they taste just so much better when it’s made at home. And when we decided to move to Korea, I realized it would be a great opportunity for me to learn the fine art of making Kimchi from my mother-in-law. She makes one of the best Kimchi I have ever tasted. It’s not too spicy or salty but just right.It tastes fresh but also has a deep and complex flavor in the background. As the Kimjang(김장) [see my No Crazy Kimchi post for more info] season is just around the corner, I am really looking forward to making some real authentic kimchi with her very soon. 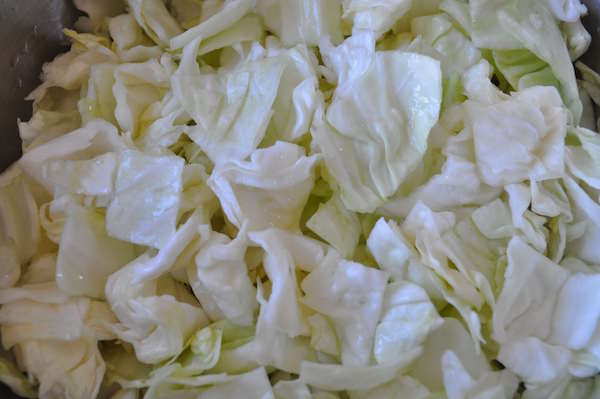 In the mean time, I will start my kimchi posts with a somewhat unconventional Kimchi that my mother-in-law will probably never make – Green Cabbage Kimchi. Green Cabbage (the regular kind used to make cole slaw) kimchi appeared pretty recently in the Korean food scene, probably because many Koreans who lived outside of Korea could not get any authentic Korean Cabbage (Celery Cabbage is the exact one but Napa Cabbage is very close). I first tasted cabbage kimchi in 1976 when when we moved to India. With no access to any kind of Korean vegetable, the only vegetable we could get was the good old cabbage. I actually did not like it as a kid. I thought it only made me miss the real Korean kimchi more. But now, I actually like it and enjoy it. There’s a lightness in flavor to Green Cabbage Kimchi that makes it go better with some foods than regular kimchi which can sometimes overpower other dishes. Making Green Cabbage kimchi is also pretty easy so I think it is a great one to start with if you have never made Kimchi before. 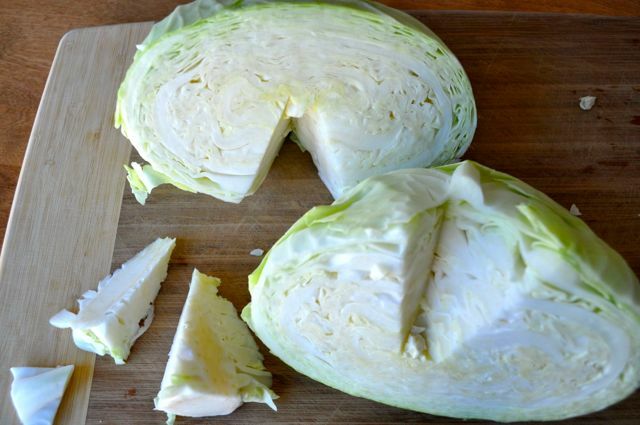 Cut cabbage into halves and cut out the core. Cut into 1 to 1.5 in width pieces -> into squares. Salt the cabbage by mixing it with salt water. Mix 3 C water and 3 T sea salt. In a large bowl, put half of the cabbage and add the salt water. Sprinkle 1 T sea salt on top of the cabbage. Add remaining cabbage and toss. Let the cabbage sit in salt water for 1 hour. Tossing 2-3 times to make sure the salt water reaches the cabbages evenly. In the mean time, prepare the kimchi yangnyeom (seasoning) by finely chopping garlic, onion, red pepper and ginger in a chopper. 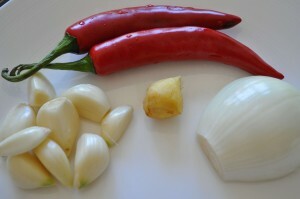 * If using a blender (as in my pic), add 4 T fish sauce because it will not chop without additional liquid. When chopping the yangnyum, don’t kill it and make it into a smoothie 🙂 . Stop when the you can still see each piece. Add 1 T sugar and 2 T dried red chili powder (고추가루 gochookaroo) and mix. Taste it. Add more or less red chili powder to your taste. It should taste quite spicy, salty and pungent. Don’t worry because this will be blended with the cabbage and the taste will get smoother with fermentation. You can also add more sugar if you like. But adding more sugar will make the kimchi sour faster. 6.Wash and clean green onions and chives. 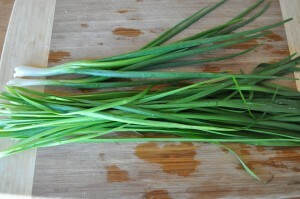 Cut green onions and chives into similar length pieces (2 in or so) and set aside. 8. Rinse and drain cabbage. 9. In a large bowl, add the cabbage, yangnyum, green onions and chives. 10. Wear plastic gloves (or your hand will be smelling of kimchi all day) and mix everything together really well. Mix things lightly – trying not to damage the vegetables. 11. Finally, taste the freshly mixed kimchi. It should taste very fresh but still pretty good. In my case, the cabbages were not salty enough (depending on the type of salt and cabbage, it comes out a little different each time) so I added extra fish sauce – 2 T. Unfortunately, Kimchi is not an exact science and you have to basically develop a feel for what it should taste like when it’s raw and then when it’s fully ripe and how you like the taste to be. Adjust yangnyum to taste. 12. Put green cabbage kimchi in a container and let it ferment at room temperature for 2 days or in the refrigerator for few days. Refer to my No Crazy Kimchi post for more detailed info on fermentation. 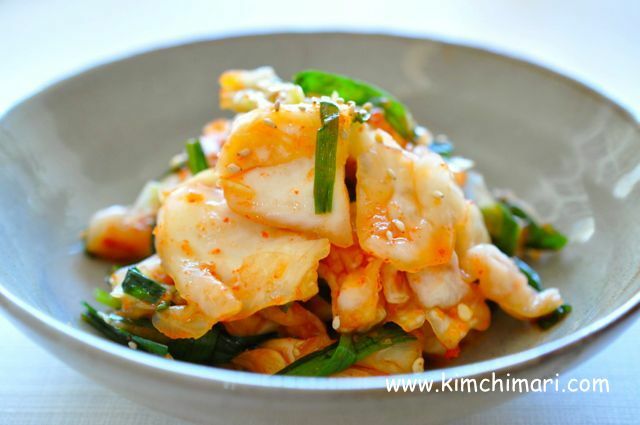 Use 5 T Myulchi Ackjeot(멸치액젓) or 4 T Saewoojeot (새우젓) for more traditional kimchi taste. Because I wanted to make a kimchi with ingredients that you can hopefully buy from your local asian market, I used a commonly found Thai fish sauce and it turned out really good too! I recently (9/27/2018) made this kimchi with my sister and we increased the spicy level by using 3 (instead of 2) fresh red chili pepper and 4 Tbs (instead of 3) red chili powder. And it turned out wonderful! The great thing about this kimchi is that it taste great fresh or fermented. So enjoy it on the day you made it or few days after. But remember to avoid the Crazy stage! This kimchi is made from green cabbage (the regular kind used to make coleslaw) and is a good alternative to traditional kimchi if you can't find authentic Korean cabbage although Napa cabbage is a close substitute. Cut into 1 to 1.5 in width square pieces. Let the cabbage sit in salt water for 1 hour. Toss 2-3 times to make sure the salt water reaches the cabbage evenly. In the meantime, prepare the kimchi yangnyum (seasoning) by finely chopping garlic, onion, red pepper and ginger in a chopper. 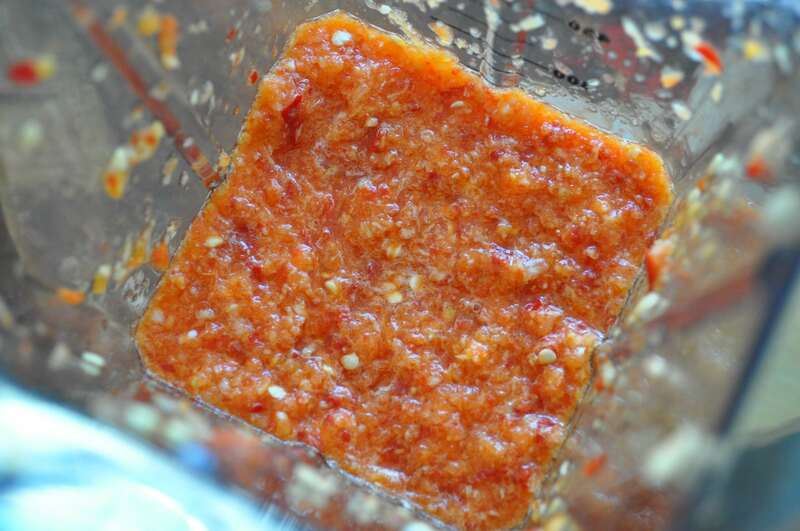 *If using a blender, add 4 Tbs fish sauce because it will not chop without additional liquid. When chopping the yangnyum, don’t overdo it and make it into a smoothie. Stop when you can still see each piece. Add 1 Tbs sugar and 2 Tbs dried red chili powder (고추가루 gochookaroo) and mix. Taste it. Add more or less red chili powder to your taste. It should taste quite spicy, salty and pungent. Don’t worry because this will be blended with the cabbage and the taste will get smoother with fermentation. You can also add more sugar if you like. But adding more sugar will make the kimchi sour faster. Wash and clean green onions and chives. 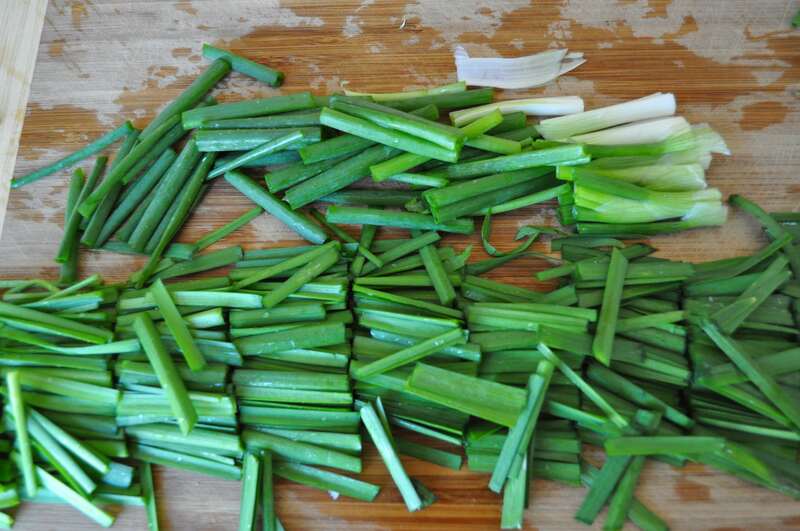 Cut green onions and chives into similar length pieces (2 in or so) and set aside. In about 1 hour, check the cabbage to see if it is ready. Except for very thick pieces, it should easily bend. In a large bowl, add the cabbage, yangnyum, green onions, and chives. Wear plastic gloves (or your hand will smell of kimchi all day) and mix everything together really well. Mix things lightly, trying not to damage the vegetables. Finally, taste the freshly mixed kimchi. It should taste very fresh but still pretty good. In my case, the cabbage was not salty enough (depending on the type of salt and cabbage, it comes out a little different each time) so I added extra fish sauce (2 Tbs). Adjust yangnyum to taste. Put it in a container and let it ferment at room temperature for 2 days or in the refrigerator for a few days. 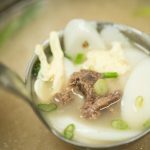 For a more traditional flavor, use 5 Tbs Myulchi Ackjeot(멸치액젓) or 4 Tbs Saewoojeot (새우젓). Because I wanted to make a kimchi with ingredients that you can hopefully buy from your local asian market, I used a commonly found Thai fish sauce and it turned out really good too! Kimchi is not an exact science and you have to basically develop a feel for what it should taste like when it’s raw and then when it’s fully ripe and how you like the taste to be. Refer to my No Crazy Kimchi post for more detailed info on fermentation. 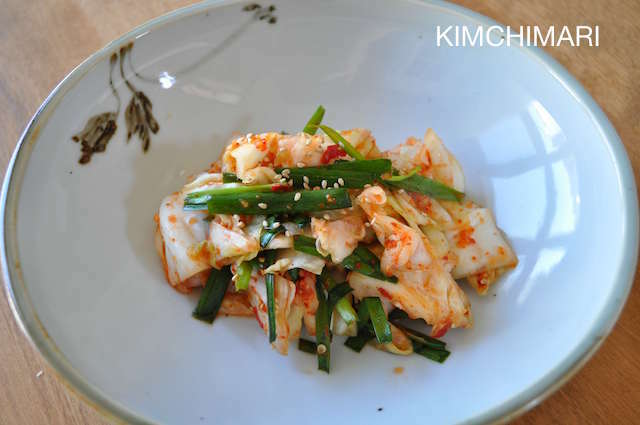 The great thing about this kimchi is that it taste great fresh or fermented. So enjoy it on the day you made it or a few days after. But remember to avoid the Crazy stage! When storing the kimchi in a jar to ferment, should it be covered with liquid? I have mine in a Mason jar, and there is only about 1 inch of liquid in the bottom of the jar. Am I doing this right? It is best that it is covered (not necessarily fully but as wet as possible) in liquid. Did you just make this? then you will likely have very little liquid in the jar. You will get more liquid over time – usually there will be enough liquid to just barely cover the kimchi after 24 hrs or so. Take a look at it frequently and press things down a couple times. If you feel that there’s still too little liquid after 1-2 days then you can always add a bit of extra liquid (make a very lightly salted water).but not so much that the kimchi is swimming in it.And only add liquid in the first 2 days or so. Not after it’s fully ripen. Let me know how it goes. This sounds good and easy. Most of the ingredients are already in my kitchen. I dislike fish/fish sauce. Is it alright to leave it out of the recipe? Is there a substitute for it? I already know I love eating Kimchi but some taste more fishy than others. Well, it will be missing a flavor but if you don’t like it, you can try making it without it. You can try substituting Guk Ganjang (Korean Soy sauce for Soup) if you have it. Otherwise, I am afraid there’s not good substitute for it that will give you authentic Kimchi flavor. Thank you for asking. Wow! I don’t get the traditional cabbage so I’m really excited for this recipe! I just made my first ever batch of kimchi with a round head cabbage but used a Napa cabbage recipe – I’m not sure how it turned out yet… Too early to say. 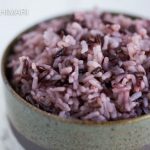 But this recipe gives me hope for the next time! Fabulous!! 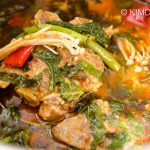 I’d be curious to know how you like the traditional kimchi recipe with green cabbage? my green cabbage kimchi recipe is on the lighter side to highlight the sweetness and crunch of the cabbage. My mom even enjoys it for breakfast because it’s so mild. Thank you so much for leaving me this lovely comment and wish you all the best with your kimchi! Thank you for such a thorough recipe; we tried it: the kimchi didn’t come out quite right, but I am sure it’s down to the quality of cabbage, not enough salting, and the particular fish sauce I’ve got. It’s still okay, but hopefully next time it will taste more like the awesome kimchi we had in Korea. Oh dear.. Kimchi is such a fickle thing to make..honestly, even my mother-in-law who has been making Kimchi for almost 60 years still have times when it doesn’t come out right. 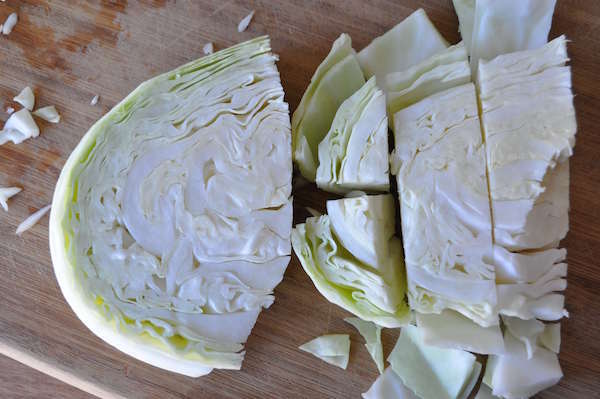 Quality of cabbage has great affect on the out come, yes, salting is important, also the quality of salt. I hope you used Korean solar salt, right? And fish sauce certainly can make the difference too. 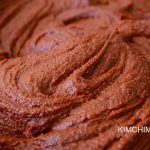 Best way to improve the Kimchi is to just let it fully ferment (see my No Crazy Kimchi on how to ferment properly) – it will taste pretty good in the end. Oh and the quality of gochukaru (korean chili pepper powder) also has an impact too. Sadly, it will be very hard to make Kimchi as awesome as the ones in Korea due to the different ingredients but thank you so much for trying. I will always try to improve the recipe so that it’s more fool proof. Thank you for writing back; well, my ingredients are all decidedly non-Korean as I am in Morocco, so using local mountain salt and fresh red chilis. I had a Korean friend here make a great kimchi with local ingredients, so I am not going to give up. I will let my first batch ferment longer (taking out a little for a salad); I’ve previously fermented just cabbage Russian style, so I think a bit more sourness will definitely help. 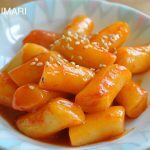 I read your post on ‘crazy kimchi’ also; fascinating detail! Thanks again. Sure. Of all things, I think the salt can be the most important. Non solar sea salt can have a bitter flavor at the end. But since your friend succeeded perhaps it’s doable with the mountain salt. Just use the same salt she uses. Fresh red chilis should work. Good luck and keep on trying! Do I need to open the jar periodically or turn it over to saturate the veggies while it ripens? Or should they be submerged without having to flip the jar? Thanks! Hi! Best thing is to keep them submerged without turning it over or flipping the jar. 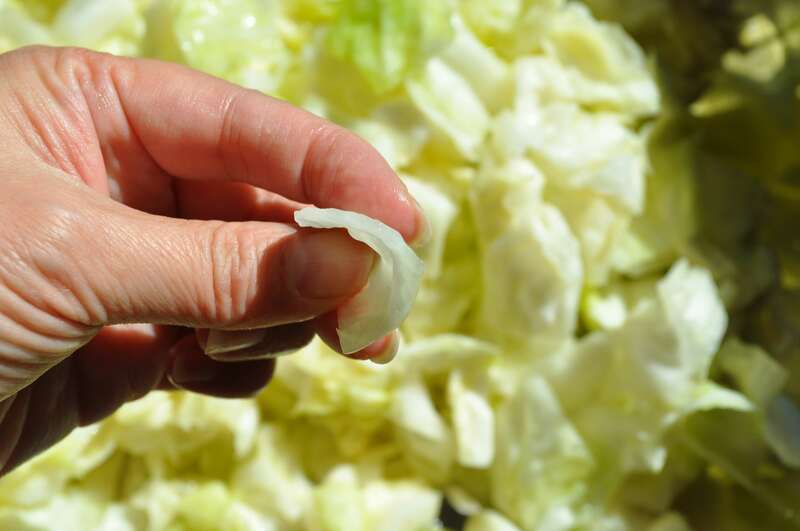 It may not seem like there is enough liquid in the beginning but more liquid will come out from the cabbage and the liquid should be almost equal to the level of the cabbages. Make sure you press down the cabbages right after and every now and then to keep them submerged. When you eat, you may want to eat cabbages from a layer below for the first few times until the liquid will be more than the cabbage. It is best not to disturb the kimchi after you make it until it ripens. Hope this helps!! Good luck! hi , i really want to ask if i can put other ingredients in like carrot and radish if that will effect the kimchi making or not ?? Oh, sure, both carrot and radish are used in regular cabbage kimchi a lot. So definitely it will work great with green cabbage! Thank you for loving my posts!! 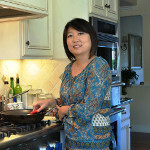 I have a Korean cooking blog as well and YouTube channel with about 5200 subscribers. It would be wonderful to collaborate with you sometimes. Thank you for contacting me and also for letting me know about sharing my recipe. I really appreciate that. I saw your youtube channel – you are very entertaining!! I am open to collaboration – not sure how we would do that. Do you have any ideas? I would be very interested in hearing more.. Please email me at jinjoofood(at)gmail and we can discuss further. Please, I suggest you make some. I understand you’re probably camera shy but it’s fine if your hand just appear lol I really don’t know how to explain but it just taste and smells gassy, I hope I don’t sound too ignorant. Did you fill up the jar with any additional water? Haha..sure I will def. think about it. You will have to give me feedback if I do it. 🙂 Hmm.. it is supposed to smell and taste a bit pungent but in a good way. What kind of Kimchi did you make? I normally do try to fill up with extra liquid so that the vegetables stay wet and not dry. When making the additional liquid, add salt water and not plain water. I wonder if you are not adding enough salt? It sounds like it is going bad before it properly ripens. Question, if I’m using Cayenne pepper how many Tbs would be best to use? I can’t find any peppers and only found the powder. Hi. So the fresh peppers are actually not that spicy and cayenne is known to be medium hot. If you are substituting cayenne for all then I would start with about 3 Tbs (instead of 2 T fresh chili + 2 T dried chili powder) and see how you like it. The spiciness will go down and get milder as the kimchi ripens so it will be perfect if it tastes a little spicy to you when fresh. If you don’t like things spicy, you may even want to start at 2 Tbs and go from there. Good luck! How you considered making a vlog? I’ve tried to do Kimchi myself twice and failed miserably, I really want to make it at least right for once. I don’t know where I’m messing up. Hi! I have been thinking about doing a video but I don’t feel comfortable appearing on camera.. lol.. maybe I’m thinking of just showing my hands.. :)) Hm…how does your Kimchi turn out? What is the problem? The taste? Bitter? or does it come out mushy? Let me know if you can. Hi! I just foind your blog. Wooww :)) i love your crazy kimchi diagram hahaha!! Ive been making and selling kimchi and the few last batches i made were… extremly , very very much a disaster. The veggies looked with a bit. And.. smelled extremly disgusting. Like..a mix between amnonia and chlorine. I left them on my counter for.. 4-5 days. Hi Iris,.. hmm.. not sure why your kimchi smells so bad. Are you saying you had success before but the last few batches smell bad? Have you changed any ingredient? What vegetable are you using? I will need more information to help you. Join my facebook group https://www.facebook.com/groups/kimchimari/ and maybe you can share photos along with questions. Thank you. I add green apple to my kimchi. I don’t know if that’s offsetting the taste. Apple is not a traditionally used ingredient in Kimchi. Although some people do – I think the green apple may be a bit too sour? 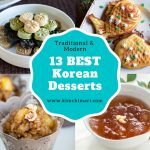 Try not adding the apple and maybe some Korean pear if you have it. You can do it without adding the pear. Thank you for sharing this recipe! I am from Romania and I love Korean food. I was twice in Korea and wrote a lot of posts on my blog about it. I cannot find the right cabbage in my country, only this that you describe here. I looked a lot after such a recipe! Thanks again. So glad you found the recipe! I totally know what you mean – hope the recipe works out well for you! Thanks so much for stopping by. Good luck!! Thanks for posting this! Yours is the first recipe I’ve seen with ‘regular’ cabbage and I wish I’d found your recipe a few days ago! I had a cabbage and a ghost chili pepper from my parents’ garden and thought it’d be great to try making kimchi. Unfortunately I used a recipe that called for much too fish sauce. Yikes! It’s ok but i wouldn’t try to convert anyone to kimchi with this batch. I look forward to using your method. Any of you thinking of trying to make kimchi, I day is worth it! 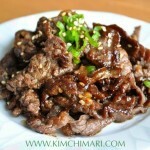 I’m looking forays to using JinJoo’s recipe and method. I made to huge heads and am excited. Thanks for the east to follow recipe!! I hope it turns out well! 🙂 Love to hear how it turned out~Thank you for your comment. 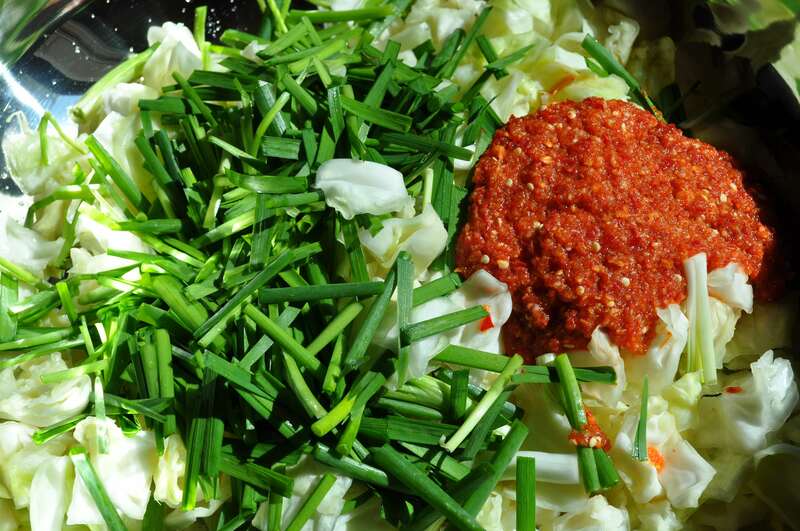 Delicious easy to make kimchi… Can’t wait to use this kind of recipe. How about adding in tablespoons of kimchi juice from previous kimchi batch? It becomes a little instant kimchi recipe since the red liquid contains probiotics, and it taste so vinegary. 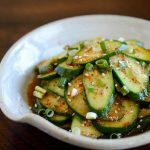 Can I replace fish sauce with soy sauce? One of my cousins has seafood allergies. I have actually never tried reusing old kimchi juice but heard about it..I should try it. I would recommend replacing fish sauce with soy sauce. Either just use good quality sea salt alone or add a little bit of stock made from sea kelp and shitake mushrooms. Let me know how it turns out! Thanks so much for stopping by! Actually there is fish sauce that uses shrimp instead of fish. You just need to look at the ingredients list closely because there is also a brand called Shrimp that uses fish. My son is allergic to fish but has no problem with shell fish and I found this out when wanting to make Pad Thai for him. 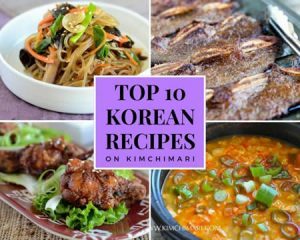 I just tried kimchi for the first time ever from our farmer’s market and love it so I will be trying your recipe! Oh wow! I did not know that~ Thank you so much for the info. 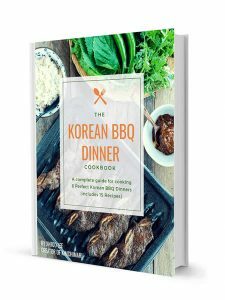 So happy to hear that you liked Kimchi your first time! Hope it turns out good for you~ take care! Made this last week..yum, delicious! The first kimchi I ever tried was made of green cabbage (in a Korean/Japanese restaurant) and I used to ask the owners for an extra portion every time I went because it was so good and crunchy! When I left the area, I never found this type of kimchi again so it was really nice to make it myself and get to try it again. As much as I like the regular kimchi, I really enjoy the extra crunchiness of this one I must say. You are so welcome! Yes, for some reason, cabbage kimchi is hardly sold at stores but only served at restaurants. Glad you got to make it yourself.